Back in August, the SojournKids writing team had the privilege of visiting the Lifeway Campus Store in Louisville for their monthly story hour. Lindsey Blair, Bobby Gilles and Tessa Janes all had the opportunity to read their book, Pastor Daddy. Gretchen Neisler did a nice little write-up of the event here. 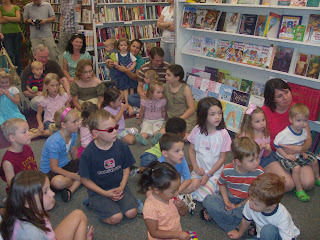 If you look closely, you can see Rachael and I sitting in the back by the corner of the bookshelf. She was more intent on watching the older girls in the room than she was on the story. I love the boy in sunglasses in the front. Child of a Sojourner? Pastor Daddy is Sojourn's first children's book. It was written to teach preschool children the Christian doctrine of the home as a “little church” where the father teaches his family God’s commands and leads them to worship the one true God. Follow the link above to see reviews or purchase a copy. Gretchen Neisler works on staff at the Lifeway Christian Store at Southern Seminary here in Louisville. One of her many duties is keeping the Children's section shelves stocked with some of the best Christian books for kids. In her Genderblog article, "Reading is for Girls: Choosing the Right Book", Gretchen encourages parents of girls to ask three key questions about the books they choose: 1. Who is being admired in the story? Does this heroine have a truly admirable character? 2. Does this book address a problem that is particular to my daughter or to all girls? Will it afford teaching opportunities for me? Will there be topics that I can further discuss with my children. 3. How are authorities portrayed in the story? Does the book encourage submission to authorities God has established? Does it encourage rebellion? You can see a longer version of Gretchen's essay or read her review of our own Pastor Daddy at her personal blog, Gret Reads 24/7.